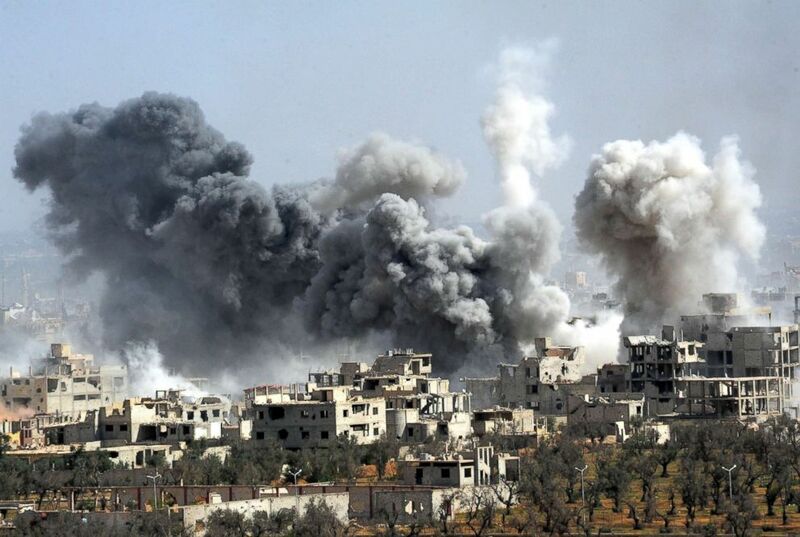 Russia flew in an 11-year-old Syrian to back its claims the attack was staged. camera (Peter Dejong/AP) Hasan Diab, 11, during a press conference at The Hague, Netherlands, April 26, 2018. Russia has been accused by Britain and France of organizing an “obscene masquerade" after it flew in several Syrians to the headquarters of the Organization for the Prohibition of Chemical Weapons (OPCW), who Russian officials claimed could prove the chemical attack in the Syrian town of Douma this month was fake. Russian diplomats presented the alleged witnesses at a news briefing at the OPCW’s headquarters at the Hague in Holland Thursday, ignoring objections from the organization itself. With the presentation, Moscow sought to support its claims that the Syrian government was not behind the chemical attack, which later prompted retaliatory missile strikes from the United States and its allies two weeks ago. 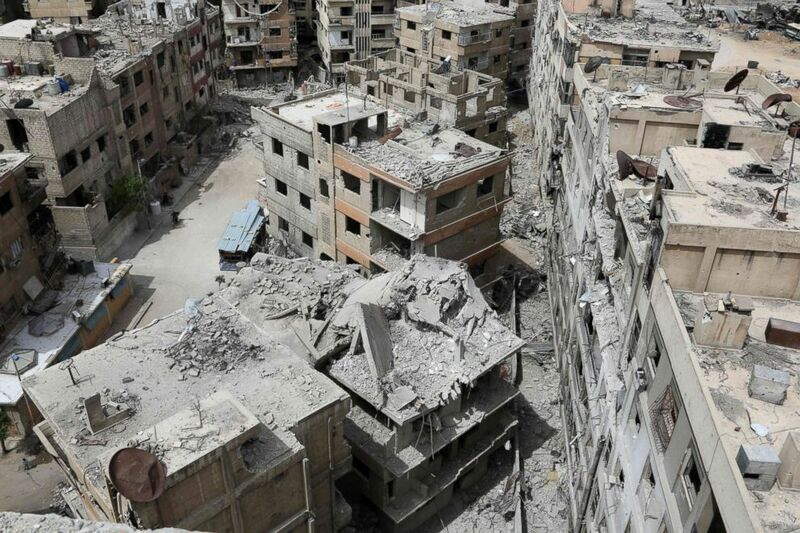 (Stringer/AFP/Getty Images) The former Syrian town of Douma on the outskirts of Damascus, April 17, 2018, after the Syrian army declared that all anti-regime forces have left Eastern Ghouta, following a blistering two month offensive on the rebel enclave. Russia held the presentation despite a request from the OPCW to wait until it had completed its own investigation of the attack. France and Britain, which joined the U.S. missile strikes two weeks ago, refused to attend the presentation, denouncing it as a gruesome stunt. "This obscene masquerade does not come as a surprise from the Syrian government, which has massacred and gassed its own people for the last seven years," France's ambassador to the Netherlands, Philippe Lalliot told Reuters. Since the first reports appeared of people suffering from apparent chemical poisoning in Douma, Russia has pressed two narratives, backing Syrian government claims that no attack took place, while also alleding to have found chemical weapons produced by rebels and even Britain in the area near Douma. Russia’s military has fixated on one video released by the White Helmets, a well-known group that rescues people from buildings hit by airstrikes in rebel areas. The video, that was broadcast by media around the world, shows panicked people in a hospital apparently after the attack being doused with water in an attempt to wash off chemicals. Russia’s defense ministry has claimed though that the video was set up by rebel activists, alleging the activists had filmed themselves simply hosing people with water and causing panic by shouting about chemicals. The alleged witnesses brought out by Russia at the OPCW Thursday said they had been present at the hospital shown in the White Helmets video. Among them was an 11-year-old boy, who was featured prominently in the video. The boy was also interviewed by Russian state television last week, which identified him as Hassan Diab, along with a man purportedly his father, who in the reports echo the Russian military's version of events. Russian media has been heavily promoting the interview and Russia’s ambassador to the United Nations, Vasily Nebenzya referenced it in a speech. 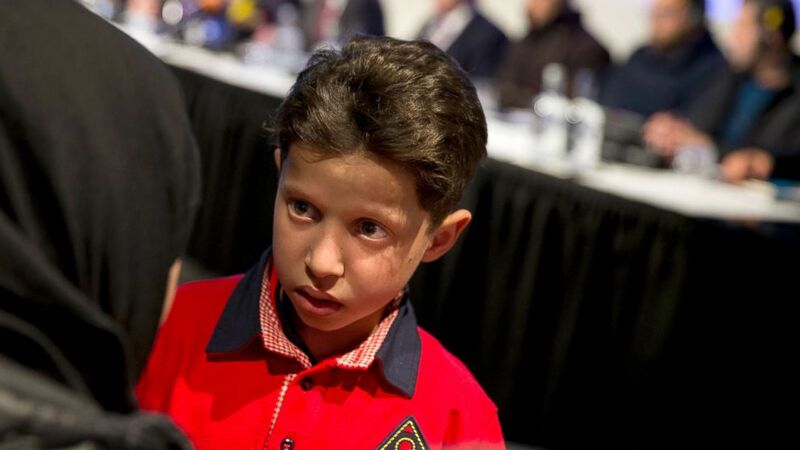 (Peter Dejong/AP) Hasan Diab, 11, during a press conference at The Hague, Netherlands, April 26, 2018. “The OPCW is not a theatre,” Wilson said. "Russia's decision to misuse it is yet another Russian attempt to undermine the OPCW's work." OPCW inspectors are currently in Syria to investigate the attack, and have visited Douma twice, following days of delay after the team was fired on there. Britain has accused Russia and Syria of using the delay to try to cover up traces of the attack and the U.S. has warned it's concerned the site may be contaminated due to tampering. The clash reflects how the OPCW is struggling to retain its influence as a neutral arbiter, amid Russian rejections of its work. Last week, Russia suggested it will not accept the OPCW's conclusions from its investigation into the poisoning of a former Russian double-agent with a nerve agent in Salisbury in Britain -- an incident that the United Kingdom and the U.S. have said Russia bears responsibility for.